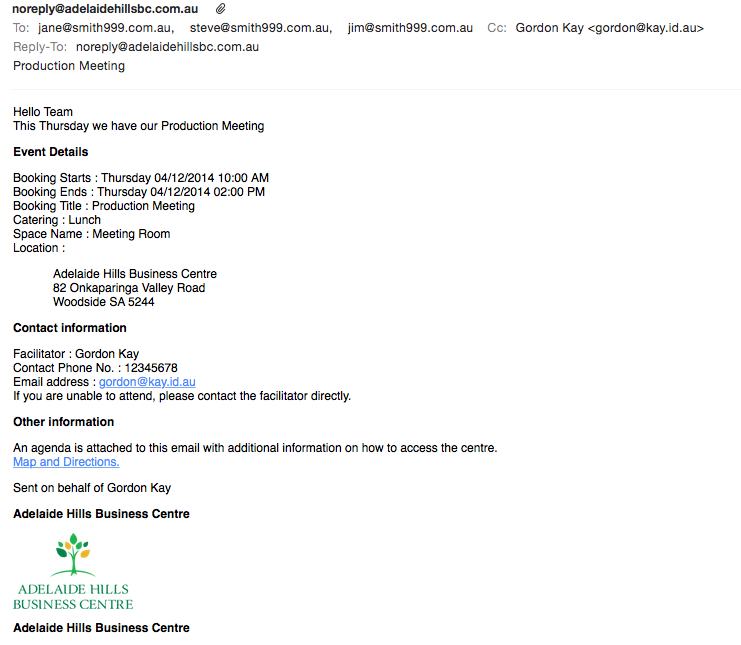 Adelaide Hills Business Centre: Meeting Builder saves you time. Meeting Builder saves you time. When was the last time you planned a meeting, thinking it would only take an email or two. Then to discover two hours had past you by. To help you simplify the process, the AHBC has developed "Meeting Builder", an easy and fast booking system that circulates your meeting agenda, invites your guest via email and calendar events and sends them information on how to get to the venue and much more. Combined this with any catering needs and now you can focus on what counts. A highly productive meeting whereby your guest are informed and ready to go. Step 1 - Go to www.adelaidehillsbc.com.au web site and select menu option "Spaces"
Step 3 - Complete the online booking form. Enter your email address, phone number and a name for your booking. The booking name will appear on the AHBC room status display and booking calendars. 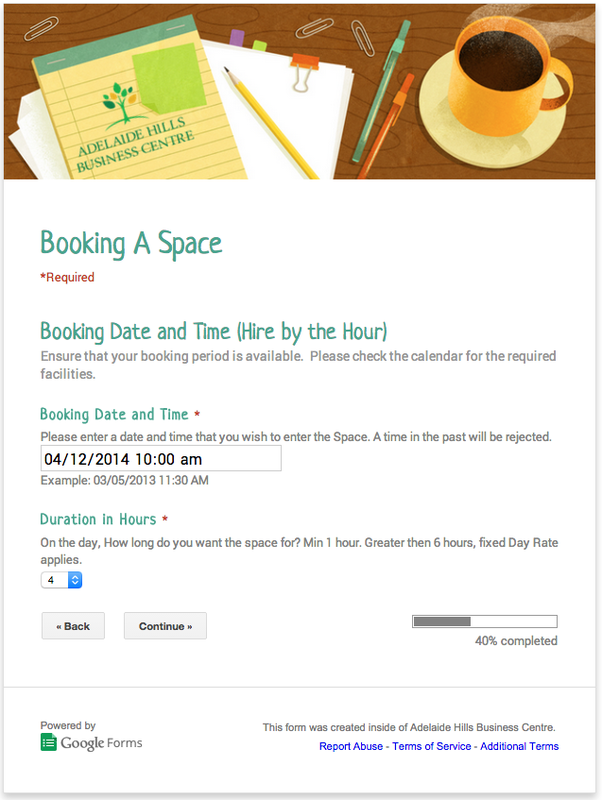 Specify your meeting time and duration. 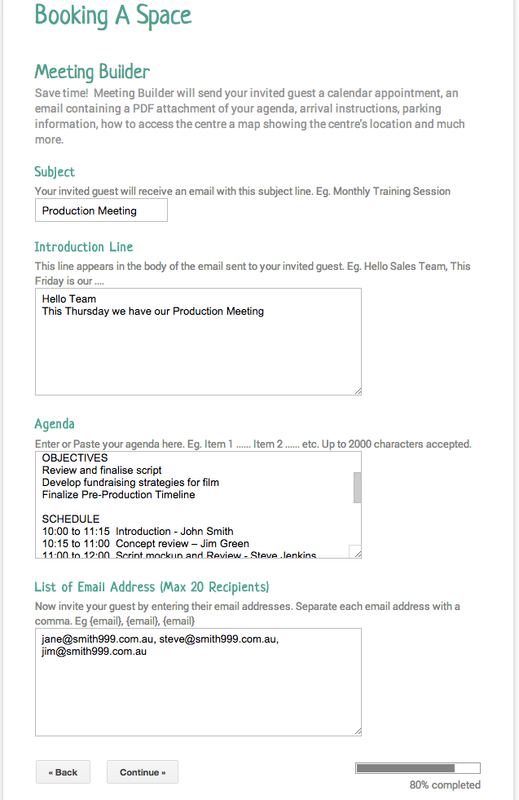 Meeting Builder has four main sections. Subject - Your guest will see the subject as the email's subject line. Agenda - This should contain a list of items you wish to cover during the meeting. List of Email - enter the email addresses of your guests. Now complete the remaining questions to book your space and process your invites. Within a minute or two the following happens. Your booking appears on the AHBC booking calendar to confirm your booking is secured. You receive an email containing a PDF agenda, confirmation of your booking and any catering ordered. In addition, you will receive your access code to unlock the hired space. 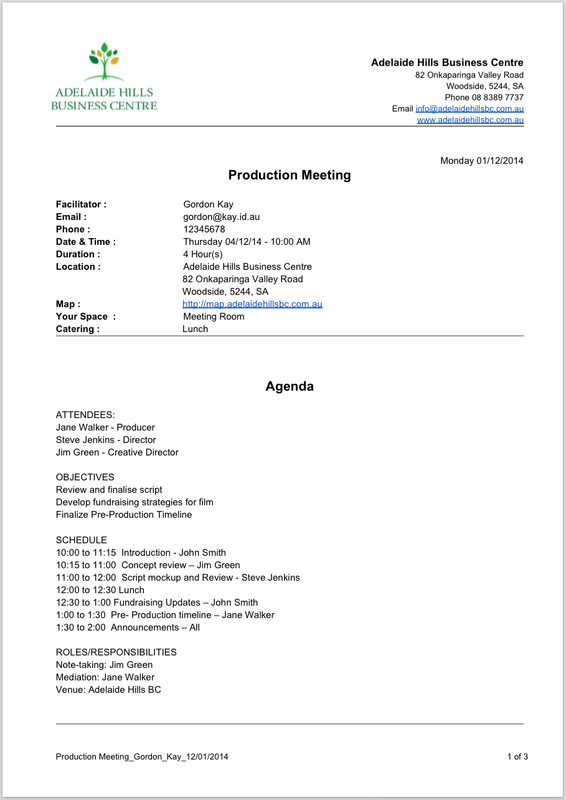 Your guest receive an invite email with the PDF agenda document attached. The agenda include other helpful information to locate the venue and your contact information. You and your guest receive an electronic calendar appointment. Catering is ordered ready for your meeting.